PYEONGCHANG, South Korea - Canada's on a roll at the Pyeongchang Olympics even if some recent high-profile losses have stung. 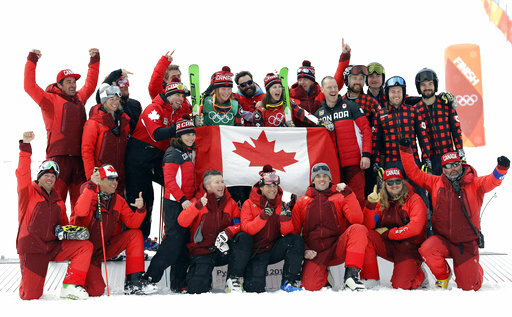 The Canadians won their 27th medal on Friday, which is the most for the country at a single Winter Olympics. Kaetlyn Osmond earned bronze in women's figure skating to set the record. RECORD: #PyeongChang2018 is #TeamCanada's most medals won at a single Olympic Winter Games! Canada has done well over the past several Winter Olympics, winning 24 medals in 2006, 26 medals in 2010 and 25 medals in 2014. The Canadians have been even better at the Pyeongchang Games and they still have a few more days to earn more hardware. There's a good chance they'll beat the U.S. in the overall medal count for the first time since 1998. Some of the games' biggest stars have been figure skaters Scott Moir and Tessa Virtue, who dazzled during their performance in ice dancing. But it hasn't all been good news. Some of Canada's most popular teams - like in curling and hockey - haven't had their usual success. The women's curling team was eliminated during pool play while the men's team lost to the United States and Switzerland in the medal rounds to finish fourth. The women's hockey team had won four straight gold medals before losing to the U.S. 3-2 in a shootout on Thursday and settling for silver. The men's team lost an even bigger shocker late Friday night when Germany upset Canada 4-3 in the semifinals. The Canadians were two-time defending champions at the Olympics and Germany is not considered a hockey powerhouse.